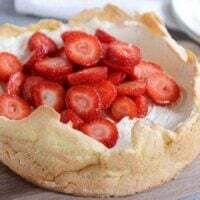 This easy to make strawberry cream puff cake with a tender, cream puff shell and light and creamy filling is amazingly delicious! My Aunt Marilyn introduced this wonder of a cream puff cake to me years and years ago (it should look familiar to some of you!). It’s been an oft-made and very favorite cake ever since. I can’t even count the number of times this has been my go-to dessert when company is coming over. It is always, always a hit. This cream puff cake is elegant, so simple, and out-of-this-world delicious. Plus, you don’t have to fuss over individual cream puff shells that may or may not collapse on you and cause you to say and think very bad thoughts about cream puffs in general. 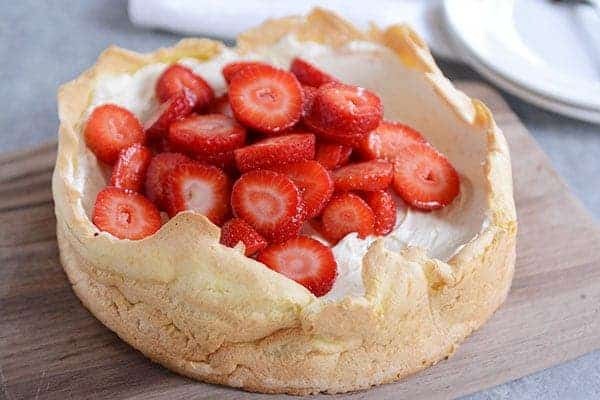 The base of the cake, baked in a springform pan (or a 9-inch cake pan in a pinch), is exactly, exactly like a cream puff shell: tender and light with that classic, delicious cream puff taste and texture. It holds up perfectly for the pillowy and light, creamy filling infused with just a little bit of fresh orange zest (my favorite part of the whole equation). Topped with strawberries, this is a masterpiece – and a pretty easy one at that. If you’ve been hesitant to make real, live cream puffs part of your baking repertoire, ditch that goal. At least for now. Instead opt-in to this simple and amazing dessert. I know the instructions look lengthy, but that’s only because I’m giving you lots of details to ensure 100% success (not hard when it’s this straightforward and simple). I’ve continued to make this strawberry cream puff cake exactly as written. That slight hint of orange with the fresh strawberries just gets me. But, I have a feeling the options with that filling and fruit combo could be endless. Lemon blueberry, maybe? Creamy vanilla filling with chocolate ganache glaze? I’m thinking maybe it’s time to explore some other tasty possibilities. Strawberry cream puff cake! It’s a thing. And a really, really good thing at that. I hope you love it! Preheat the oven to 375 degrees F. Lightly grease the bottom and sides of a 9-inch springform pan with nonstick cooking spray. For the cream puff base, in a medium saucepan, bring the butter, water and sugar to a boil. Add the flour all at once and stir quickly with a wooden spoon or rubber spatula until the mixture forms a ball and pulls away from the sides of the pan. Remove the pan from the heat and stir the mixture until smooth. Scrape the mixture into a medium bowl or into the bowl of a stand mixer fitted with the paddle attachment and let cool for 5 minutes. Add the eggs one at a time and beat with a handheld electric mixer (or with the stand mixer) until the mixture is shiny, 1-2 minutes. Don’t overbeat. Using an offset spatula, spread the mixture on the bottom and 1-2 inches up the sides of the prepared pan. If it's difficult to spread, use your fingers (wetting them with cool water lightly may help) to evenly portion the mixture into the pan and then spread with the spatula. Bake the cream puff shell for 20-25 minutes, until just golden. Remove from the oven and prick the bottom and sides with a toothpick 10-12 times. Return to the oven and bake 5-10 minutes more until golden brown but not overbaked (you can insert a toothpick into the center and if it comes out with sticky dough, it still needs longer in the oven). For the cream cheese filling, beat the cream cheese with an electric mixer until smooth, 1-2 minutes. Gradually add the powdered sugar and continue to beat until mixture is smooth, another 1-2 minutes. Add the orange zest, vanilla, and whipping cream. Whip with the mixer until the mixture is thick and creamy, 2-3 minutes. Spread the filling over the cooled cream puff shell, cover with plastic wrap and refrigerate for at least an hour or up to 24 hours. Combine the strawberries and sugar and let the mixture sit for 5-10 minutes (or up to several hours) before serving. To serve, pile the strawberries on top of the cake. Remove the sides of the springform pan, slice into pieces and serve. Alternately, you can slice the cake before adding strawberries and add them to each individual serving. If you don't have a 9-inch springform pan, you can use a 9-inch cake pan in a pinch. The slices won't cut as neatly, of course, and the shell will be slightly thicker based on the lower sides of the pan, but it should work. Recipe originally posted October 19, 2009. Hi Mel – still love this recipe. However, I was looking at your mini cream puffs (which I have not been brave enough to attempt) and was wondering if you have ever used that filling in this cake? I haven’t – but I bet it would be delicious! Mel, this was FANTASTIC! The perfect thing to serve for our Easter dessert. Thank you! I loved the idea of this cake so I tried to make it yesterday but it didn’t turn out as it was supposed to. The cream cheese filling was still fluid after being in the fridge for over 18 hours and ended up making the shell soggy. I followed all the steps and even made my mother check everything so I’m not sure where it went wrong. The filling tastes amazing but I changed the vanilla extract to a vanilla bean for extra flavour. I alsp had to use a lower fat whipping cream since we don’t have wipping cream with more than 35% fat in the Netherlands. I hope you can help me out with what went wrong. I’m guessing it was the lower fat cream that caused the issue – is it the type of cream that will whip into stiff peaks on it’s own? I’m sorry this didn’t work out for you! 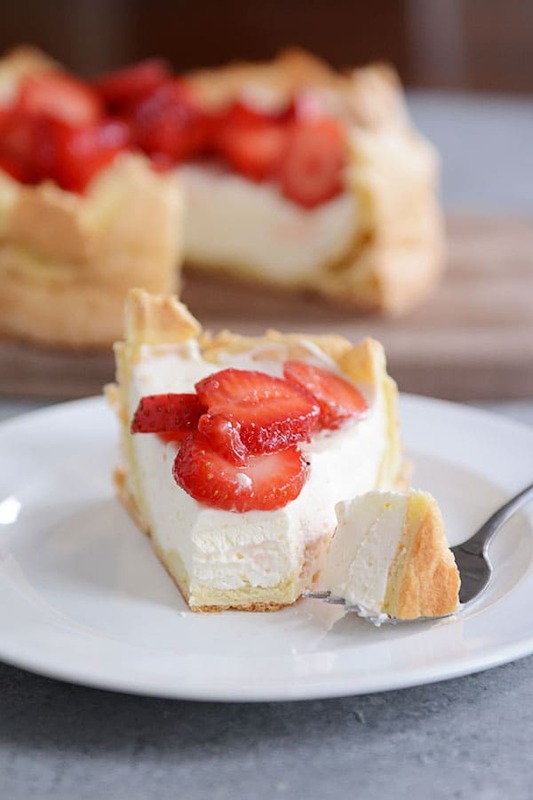 The filling should be very thick and creamy so if you have another type of cream that can be used to thicken it next time, that would hopefully do the trick. This is really great. But please don’t scare readers from pâte a choux; cream puffs are über easy to make! Hi Mel! We are making this for a “delivery cake” for tomorrow when (we hope) our newest bundle of joy will have arrived! As we are making the crust, it appears to be fairly thin/more like a batter than a dough, it cannot be pushed up the sides of the springform. We both (my mother in law and myself) read your directions and feel like we followed them- but this doesn’t seem to be the case… Who knows- we do know that however it looks, it will taste delicious! Oh, that’s odd, Sara! It definitely shouldn’t be that runny. Did you use extra large eggs by any chance? Although it bubbled it was delicious. One questions for clarification. When mixing the cream cheese, whipped cream filling, is the paddle used on the standing mixer or the attachment for whipping? I used the paddle and although the mixture was creamy and thick, I do not believe that it was as thick as it should have been. Thank you. Hi Risa – you can probably use either but I usually use the paddle attachment. My cream puff mold in the spring form pan bubbled way before it was time to pierce it with a toothpick. Can’t figure out way. I am still going to use it though since I don’t want to waste ingredients. Thank you. Mine bubbled too, but went ahead and pierced all over and it dropped. It was wonderful. We had one piece leftover and it was okay the next day. Best to make this the day of. I am a relatively new subscriber to your blog, have been pinning your recipes, decided and yesterday was the day to try one of your desserts. 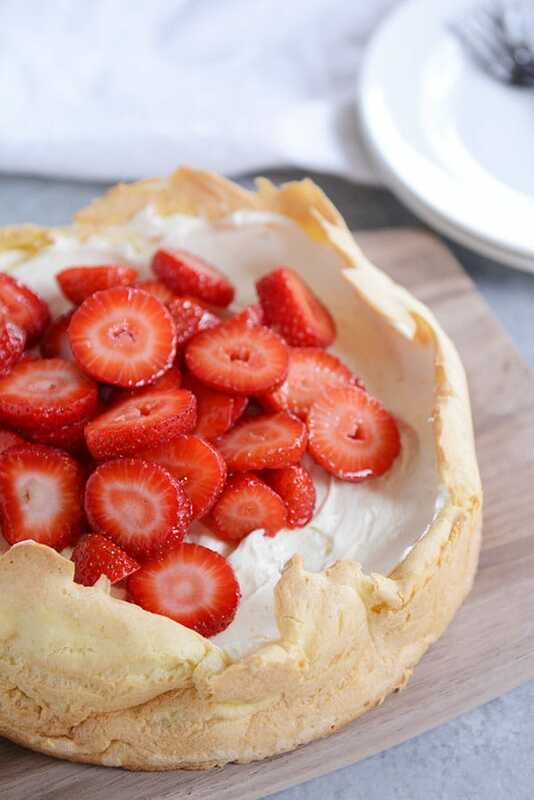 My husband loves cream puffs and he loves strawberries so when I saw this recipe I knew I had to make it. It turned out soooo good! I can’t wait to check out your e-book! Thanks, Vikki – so happy to hear it! I have a similar recipe, as an eclair cake. Same crust…pudding and cream cheese layer, whipped cream, drizzled with chocolate sauce! Cant wait to try this version. Do you think it would work doubled in a 9×13 pan or even a cookie sheet? Thats how I do the eclair cake and it works beautifully. It looks just like Australian pavlova! Makes me miss home! Pavlova is more of a meringue topped with fresh kiwi fruit, strawberries, blueberries, papaya. Soooo yummy! Have you tried making pavlova, Mel? Hi Mel, We love following your blog. When you say tried and true you capture it exactly. I am wondering if you have suggestions for making individual smaller versions of this cake – what kind of pans would you use? What might the cooking time be? Thanks. I think you could make this in cupcake-size portions. I haven’t tried it myself but I think it stands a good chance of working if you portion out the cream puff dough in the bottom and up the sides of the cupcake tins. Good luck if you experiment! Mel- is it possible to do this recipe in cupcake form? Good question, Shelli – I haven’t tried it but I think it could work pretty well. Good luck if you give it a go. Okay, this recipe is sooooo calling my name!! I was in Paris this summer and took a cooking class where we made eclairs…we made some quick ‘cream puffs’ with the unused pate a choux …I fell in love with this dough and the end product…I’m wondering if the orange cream part of this recipe would work to fill a cream puff so I can keep a stash in the freezer…making this cake would be mucho dangerouso with just me in the house!! I think this filling would be delicious for a cream puff! I just made this cake and it looked great coming out of the oven, as high as the cake pan but when it cooled it dropped to about an 1″. What did I do wrong? 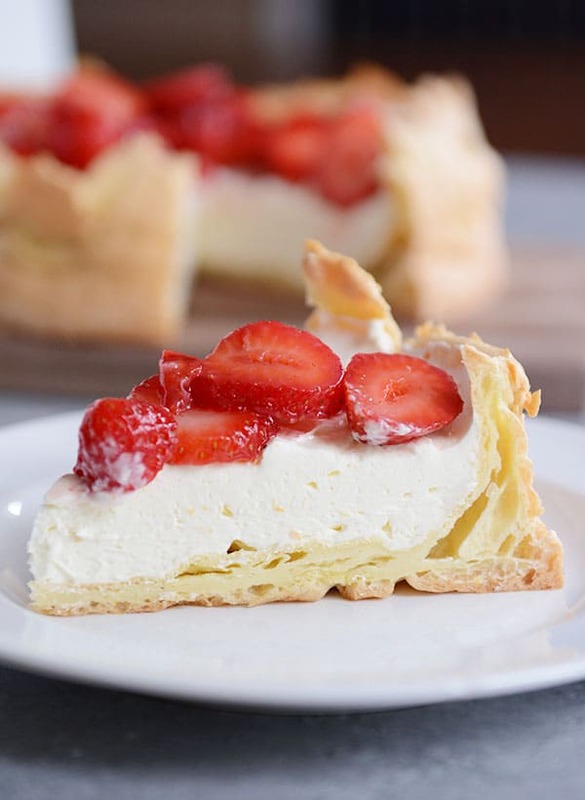 Aneta – The cake is supposed to fall in the center – the sides should stay high and then the center falls to create a perfect spot for the creamy filling. It sounds like you made it correctly! thanks. I will try it again. When you prick the pastry with the toothpick, do you do it all over the cake or just in the middle. I followed the directions exactly so Im just trying to figure out where I went wrong. Aneta – It’s been so long since I made this that I really don’t remember but I think I just prick all over but mostly on the bottom. I had to say this was fantastic as usual Mel. I made it this morning. I felt comfortable making it ahead but i got too busy yesterday. I forgot the time and overlooked the base by five minutes, then poked holes and cooked for 3 more. But it turned out fine. The cream spread was just…well let’s just say I’ll be making a bowl of it just to eat by itself soon. I know, shame. But it tasted just like a dreamsicle (spelling?) from when I was a kid. I seriously doubted putting the orange zest thinking it would taste like the rine but it was to die for. I feel like I know my cream toppings, and out of dozens this is definitely top 3. Old southern dessert expert ladies approved! Thank you that does help. I have one more question. Can the base be made 24 hours in advanced and either put in the fridge or covered in foil? I’m going to make the cream layer tomorrow but would like to prep as much as possible today. Cearrow – Sorry for the delayed response. Did it work out for you? Even though I haven’t tried it, I think the crust should be able to be made ahead of time so I hope it worked out! You mention just slicing strawberries and adding sugar and refrigerating, and then after you mention frozen strawberries and cooking them on the stove. My question is do I boil the strawberries if they are fresh as well or only if frozen? I’m making this Easter As well as the lemon berry trifle and I’m making the raspberry trifle next week. I had a hard time picking one! Cearrow – no, when I use fresh strawberries, I just mix them with a bit of sugar and let them macerate for a little bit. I only simmer them if they have been frozen since they aren’t quite as pretty/tasty straight from the freezer. Hope that helps! I’ve been doing something similar for years using a dutch baby pancake as the base – tried yours and it was yummy – used mango, kiwi, strawberry, raspberry with lime zest & juice – a hit…. Made this on Sunday, we ate it all up and my husband asked for it again! Good thing strawberries are on sale. Mel, I love your site, I’m pretty sure your aunt must know my grandmother Snedigar because this strawberry puff recipe is from my grannie’s cookbook, which I have posted HERE (http://littleyellowbarn.com/2012/02/strawberry-puffs/). So crazy I stumbled upon this. This really is the best recipe whenever I make it people treat me like I’m a miracle worker! Hi Mel, I made this yesterday and brought it over to my parents house for dessert. It was a huge hit. It looked as good as it tasted. Thanks! Hi Mel! I am thinking of making this for the weekend. We are a household of chocolate lovers, so I’m considering omitting the orange zest and topping the cake with chocolate sauce upon serving. Do you see any reason this wouldn’t work? Thanks! Hi Abby – I’ve never tried making this a chocolate version with the sauce but I bet it would be yummy – kind of like a deconstructed chocolate eclair! Wowzer! This cake looks fabulous! It’s much less time consuming than piping cream into tons of individual cream puffs too. I have a 4 1/2 inch springform…do you think it would work to halve this recipe?? Stephanie – I’ve never tried halving the recipe but it sounds like it should work ok in your pan. Just keep an eye on measurements and how full the pan is getting. This was really, really good and very easy to make! I was worried it might be a little heavy with the cream cheese and cream, but it was light and not too sweet. It complimented the fruit beautifully. I think I’ll try peaches with this when they come into season with a little almond extract for the orange zest. Yum! I forgot to get an orange at the store, so I had to substitute lemon zest, which was delicious. I also had some blueberries in the fridge that I threw in with the strawberries, it looked very patriotic. Thanks so much for this recipe, it was fabulous! Renay – thanks for adding your variations. I’m thrilled the outcome was delicious! I want to make this for Father’s Day! How many does it serve? How far in advance can I assemble it? Natalie – this easily serves 8 and you could stretch it to 10 probably. I would only assemble a few hours in advance so the crust doesn’t get soggy. If you are pressed for time, you could make the crust the night before and store it covered, as well as the filling (store in the fridge) and assemble an hour or so before serving. Hope that helps! I did some research and discovered that it was because I was trying to adapt the recipe so it was vegan–and no vegan substitute or lactose-free substitute will whip properly! At least it was a learning experience! Lisa – I’m sorry you had trouble with the stiff peaks! I’m not sure why that would have happened. Sometimes if the cream isn’t adequately chilled (too warm) it won’t whip up very well…that’s one of the only things I can think of. I am making this as I type. It smells delicious baking. I love your site. Some of my favorite recipes are: honey lime enchiladas, broccoli cheese soup and I just made your yummy pasta salad with ceasar dressing about an hour ago. – Thanks! Emily – I hope the cream puff cake turned out great! I’m glad that you have been enjoying recipes from here – all the ones you just listed are my personal favorites, too! I made this yesterday and my husband and kids each had 2 pieces. My one-year old just kept shoveling it in with a huge smile on her face. I doubled the filling and then used half of it to top banana bars–yum! Amanda – the image of your little child shoveling this cake in their mouth is too cute. So glad you liked this and as a topping for banana bars?? Delish! Wish I would have thought of that! Oh, my, gosh! Just made this cake for Sunday desert. It tasted like heaven in my mouth. I wondered how it would save for the next day, but there was no need to worry about it. We fought over the last piece! Chris – this makes the perfect Sunday dessert, in my opinion! So glad you liked it! Erin – hmmm, I’ve never though of using the filling as a frosting, but I bet it would work. You may need to lighten it up a bit with a bit of cream/powdered sugar. Let me know if you try it! This was so yummy. I made it two days in a row. Do you think I could use the filling as a frosting? Hi Taci – glad you like the creamy white bean chili! As for the cream puff, if you make the shell a day in advance, no, you shouldn’t need to refrigerate it. Cover it loosely but completely with plastic wrap and store it at room temperature. I LOVE your site. Your creamy white bean chili is perhaps my favorite recipe. My whole family loves it! I need to make this puff a day in advance- no time to bake on birthday party day! If I made the puff and the filling a day ahead and stored them separately, would i need to refrigerate the “puff” piece? Anonymous – the texture of the puff should be similar to a cream puff – lightly crispy on the outside with a soft, tender center. I probably wouldn’t make this the day before at the risk of the puff becoming soggy, like you mentioned. To be honest, I didn’t time it when I beat the eggs into the dough, but it wasn’t super long – I’m guessing like three minutes or so? Good luck! Let me know if you have any other questions. What is the texture of the “puff” suppose to be? Should it be crispy like a puff or bread/roll w/ light crispiness on the outside? I had the later when I made it and am thinking of trying again. Also, will this make the day ahead and be okay…not making the “puff” soggy. Brittney – only bring the strawberries and sugar to a simmer (if you decide to do it that way). The strawberries top the cream cheese, orange zest mixture (that does not need to be cooked). Hope that helps! oh YUM! 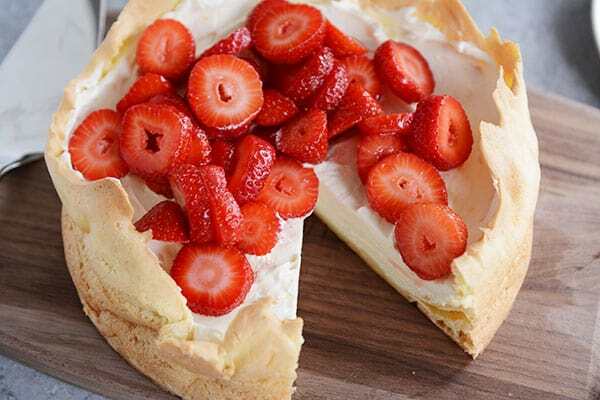 I need to know if you’re saying the whipping cream, orange zest, vanilla, strawberries, and sugar are the items that you bring to a simmer? You don’t add any of those ingredients to the cream cheese mixture that gets whipped, right? Hey Marie – I’m glad you found your way over here from the Sisters Cafe. Isn’t there blog awesome? Anyway, I’m glad you’ve enjoyed some recipes, thanks for letting me know! Got your site from The Sister’s Cafe awhile back and have come to love it; I love seeing what recipe you share with next. This one looks REALLY good. We’ve tried a few recipes of yours and loved them. Jen O – thanks for letting me know you liked the corn chowder! Great sub on the cayenne for the jalapeno. Ohh. Very similar to my recipe for eclair torte. Definitely keeping this one. Yum! This looks so delish! I’ll have to remember this for Easter dinner dessert when strawberries are in season. Wanted you to know that I made your chicken corn chowder last night…yum yum! I have another corn chowder recipe and this one is way better. My plan was to make your chicken enchilada pasta, but it was a soup night, and this was so yummy. I didn’t have a jalapeno so I put in a dash of cayenne…just gave a little bit of a zip. Thanks!! I have never heard of a cake like this before. It sounds heavenly!! If I were at your house, I’d be sneaking over for lots of bites, too! Wow. That looks fabulous! It’s almost like a pavlova except you have a cream puff base instead of a meringue. Be great with just about any fruit too. Oh yummy! I love that it has orange zest. It sounds perfect. Julie – your comment made me laugh. I’ll pass that on to my Aunt. She’ll be flattered. teresa – glad you liked the chicken corn chowder. Thanks for letting me know! Oh you are killing me with all the goodies!!! I’m going to have to give this a try this week without fail! Hmmn, I wonder if I still have my springform pan somewhere???? we made your chicken corn chowder last night for company, it was outstanding! could i please get the recipe for chicken corn chowder. i wanna see the inside! i guess i really will have to make it myself, lest my curiosity get the best of me. it sounds delicious–aunt marilyn strikes again! Great idea, peaches or blueberries!! One of my dreams is to live next door to Paula Deen. Your Aunt Marilyn would be #2, but I’ll have to survive with making all her recipes off your blog!